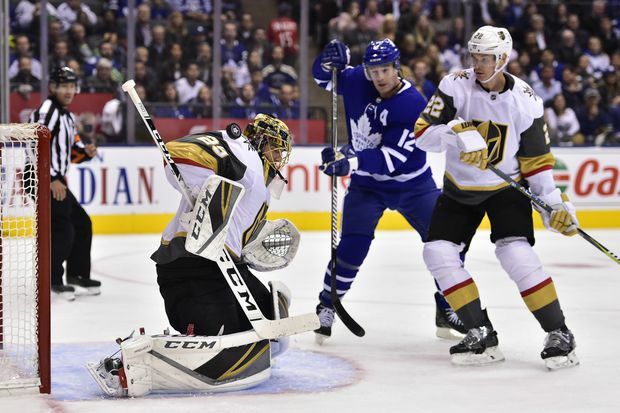 Vegas Golden Knights goaltender Marc-Andre Fleury (29) makes a save as Toronto Maple Leafs center Patrick Marleau (12) looks for a rebound and Vegas Golden Knights defenseman Nick Holden (22) defends during first period NHL action in Toronto on Nov. 6, 2018. Coming off the ice after morning skate, Las Vegas Golden Knights goalie Malcolm Subban runs into the crowd surrounding his coach, Gerard Gallant. The Scotiabank Arena hallway is completely dammed by a media bottleneck. When they built this place, they didn’t take into account the possibility that the Maple Leafs might some day be good. Now that they are, there isn’t enough room in the hallways for the media scrum. Were these members of hockey royalty, the media would be flinging themselves out of the way and grabbing hold of ceiling tiles. But despite recent successes, Vegas doesn’t yet rate obsequiousness. Subban says, “Oh no,” and stands there hopping anxiously from skate to skate. No one looks over. That works. Everyone shifts a little, creating a human tunnel. Make way for the little team that could. Now a few months removed from what was probably the unlikeliest season in NHL history, the Knights still give off a lovely ‘just happy to be here’ feeling. They don’t have many boldface names and the ones they do aren’t that bold. The result is no pecking order to speak of. There isn’t a rush to one locker once the door opens. Their biggest star, goalie Marc-André Fleury, is happily explaining to people at length why he doesn’t speak before a game, which rather defeats the point. This may be hockey’s flattest successful society. One suspects that ease flows down from Gallant. Everything delights him, including bad news. This is exactly the right sort of attitude to have in Las Vegas right now. Having got just about every single thing right last year, the team is discovering just how capricious the league can be over a long enough span of time. No more blazing starts. No more comebacks in the final 20. The offence, once a jet engine in terms of its ignition power, has become a charcoal skillet. For the first time in their history, the Knights are scraping by. Only a sixth of the way into the season, you don’t get a sense of panic yet, but certain questions are getting old. “I don’t think we’ve talked a lot about last year, to be completely honest, except when it’s brought up from outside,” defenceman Colin Miller says. He gives an amused nod at the crush of people crowding up the visitors’ locker room. What Vegas has already managed stands in opposition to some pretty basic accepted wisdom – that an expansion team can’t be great from the off and that hockey can’t conjure up a fan base overnight in a place that has no history with the game. Even while scuffling, they are paying to overcapacity crowds at home. The greatest beneficiary of all this – and perhaps the biggest loser as well – is Seattle. When it gets to the league in two years time, ‘Let’s just see how this goes for a little while’ is not going to cut it. Contention is the new bar. Then there’s the next one up. Vegas is trying to manage something not done since the St. Louis Blues had the expansion deck (groan) stacked in its favour – go from an immediate contender to a click-and-play, quasi-dynasty. In the past decade, only two teams have repeated as Stanley Cup finalists – Pittsburgh (twice) and Detroit. It’s a lot easier to go the other way. Vegas has three advantages in that regard – the relaxed expectations of a forgiving market, thinking the Golden Knights can do it and knowing few others do. The Vegas line on Vegas puts it below the top tier of favourites (I promise I will stop this). Beyond the team, there are serious knock-on effects for a lot of egos around the NHL. If Vegas wasn’t a species of fluke – done without a No. 1 draft pick, or a truly elite forward, or a single vote getter for the Norris Trophy, all built upon a goalie judged surplus to needs – what does that say about everyone else? At best, that Vegas has a better handle on how this ought to be done than anyone, arguably anyone in history. At worst, it means that many of the people running other teams are either faking it or waiting for blind luck to intervene. Possibly both. Maybe that’s why everyone in Golden Knights colours looks so serene. They can’t lose for winning, even when they’re finally losing a few. Usually, when a coach says something like this he sounds like a man who’s just found out his dog has died. Gallant’s tone is buoyant, like he’s telling you about all the things that have gone right so far. Pressure does funny things to a team, especially a good one. Just look over at the other side of Tuesday night’s matchup. The Leafs had a week-long dip and it was treated locally like they should consider hiring an exorcist. Eventually, that level of scrutiny will wear on you. Vegas isn’t worried. Its ticket-buying public isn’t worried. Everybody’s too giddy to worry. There’s another thing you can say in Nevada that would get you put on a spit over the hot stove if you did it anywhere it snows more than twice a year. Do you worry that you spoiled them a bit last year?